Once there were two friends who set out to seek a fortune. "I think we will get some work here,said Chottu." "Lets hope so Chottu",said Baddu.They started walking in two different directions looking for work.In the evening they both met at one point.Chottu asked Baddu any luck?Yes replied Baddu..Aman has told me to water his orchard everyday.I too had some luck,Chottu replied.A farmer asked me to take his cow for grazing.But where will we live asked Chottu.I found a hut.We will sleep there ,said Baddu.The next morning Baddu had watered all the plants and watered the last sapling.He saw that the last sapling was dry.An hour later he had poured half a dozen buckets of water on the sapling.He thought my master will think I have not watered it.Meanwhile at the other end of the village"I have such an easy job i will let the cow eat while I will sleep under a tree" Said Chottu. "Here graze at your hearts content:"said Chottu to the cow.She leaped forward and ran in the field. "Hey!come back !Stop! "The farmer yelled "Get that cow out of my field. ""I will get her out of the field" yelled Chottu.But the cow led Chottu over the fields.It was evening when Chottu caught the cow. "I never have had to run so much "Thought Chottu.Oh! Baddu is already back,all ha has to do is water a few saplings.He knew Baddu was as tired as he was . "Ooooh my back!I emptied a hundred buckets in the mango sapling and I will have to do it tomorrow,"thought Baddu. "Lucky Chottu all he has to do is keep an eye on a cow". 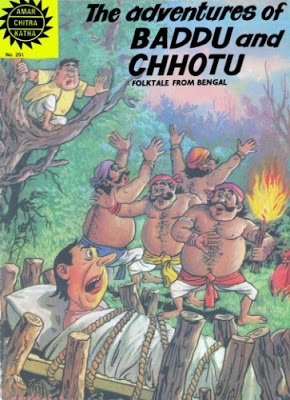 "I would better not tell him how much hard work I did.He willlaugh his head off,"Baddu thought.How did things go Baddu?,asked Chottu. "I watered the plants before half the day was gone and lazed around half of the day,"said Baddu.How did things go with you?asked Baddu.The cow gave me no trouble.I took a nap while it ate the grass.I wish I had the cot ,the ground was uncomfortable,"said Chottu.There was pin drop silence. "Lets exchange jobs,"said Chottu.The next morning when Baddu reached there,he said"Go and eat as much as you want,while I sleep"thought Baddu.there is enough grass for the cow to eat...."Hey!Where is my cow? "Come back shouted Baddu.If I leave the cot behind,someone will steal it,thought Baddu.Get that cow out of my field ,yelled the farmer. "Come back you creature"!,shouted Baddu.When it was evening ,Baddu caught the cow.Meanwhile at the orchard. "I have poured eightyfour bauckets of water in this sapling",thought Chottu.What's going on here. ",asked the master. "Why have you not watered this one",he asked.I did watered this one too ,replied Chottu.You liar! Go and get some more water for it at once shouted the master.Yes Sir ,replied Chottu.In the evening the two friends met.What a cunning fellow you are,Chottu.What about you Baddu.We have learnt a lesson ,said Baddu.I don't know why that mango sapling soaks so much water ,asked Chottu.Maybe its hollow ,said Baddu.How did it become holloe?What is buried in there?,asked Chottu.Perhaps it is Gold,said Baddu.The two friends were so excited ,they took their spades and dug and dug but didn't find anything.It's no use Chottu.We have wasted our time.Lets fill the hole and go home.Suddenly Baddu found some,it was a gold Mohur.Is there a brass pot burried here,found something Baddu?No just a pretty stone Chottu.The two friends started tricking each other because they were greedy.But Chottu got the gold..Baddu got to know that Chottu got the gold so he went to chottu's house and hid under Chottu's bed.When Chottu came out of the bed and said half of the coins are mine.So they divided the coins but there was one extra coin so Chottu told Baddu I will exchange this gold coin for silver coins,come to my house tomorrow.When Baddu came he asked a boy where is Chottu?He is dead,said the boy.When Baddu went inside he thought he is just pretendingto be dead.I will teach him a lesson.I will perform his funeral rites.Baddu took him to the forest and said I will go and get the firewood saying this ,he left.Suddenly some thieves came and when they saw the corpse they said let's cremate it.Let's gather some firewood.The thieves gathered the firewood and placed it on Chottu's bier and were about to set fire on it when Chottu started screaming.The thieves got scared and ran awayleaving their loot.Baddu climbed down the tree and untied Chottu and divide the coins but there was a extra coin.Baddu said you got this extra coin from the orchard so I get this one.Then baddu and Chottu were best friends forever. © 2013, Anvita. All rights reserved.